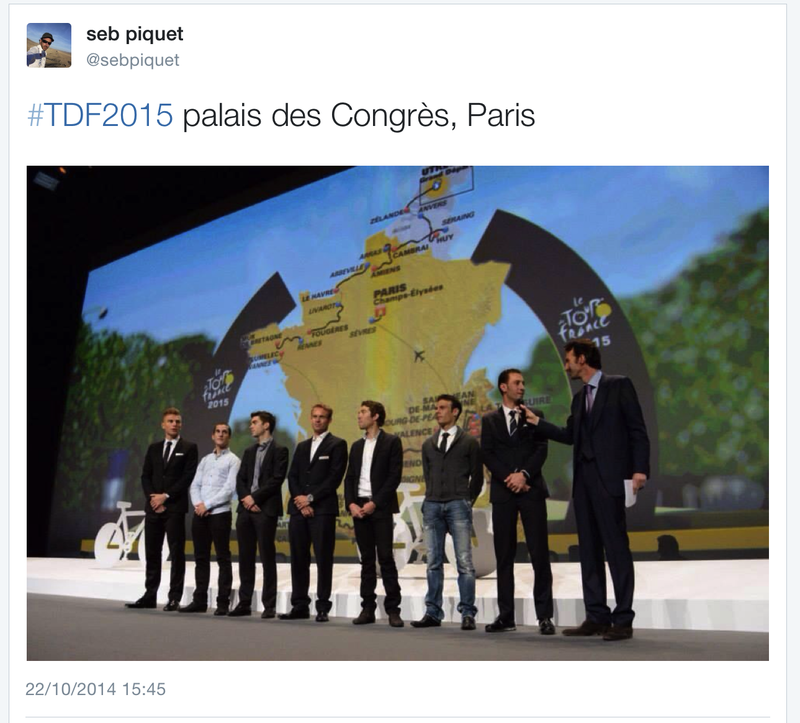 The 2015 route was officially presented on Wednesday, 22 October. And this is what it looks like (in 3-D no less!). 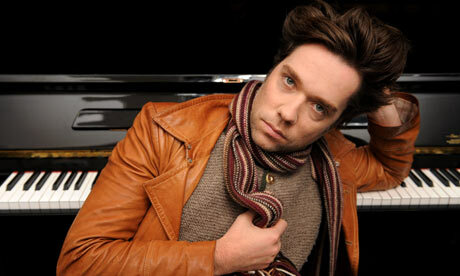 Is it just me or does Pinot look like Rufus Wainwright? Just me? Really? While we’re on the subject of French riders, Christophe Riblon was on hand and can only have been pleased to see Alpe d’Huez featuring so prominently on the route. Another day to cover himself in glory? 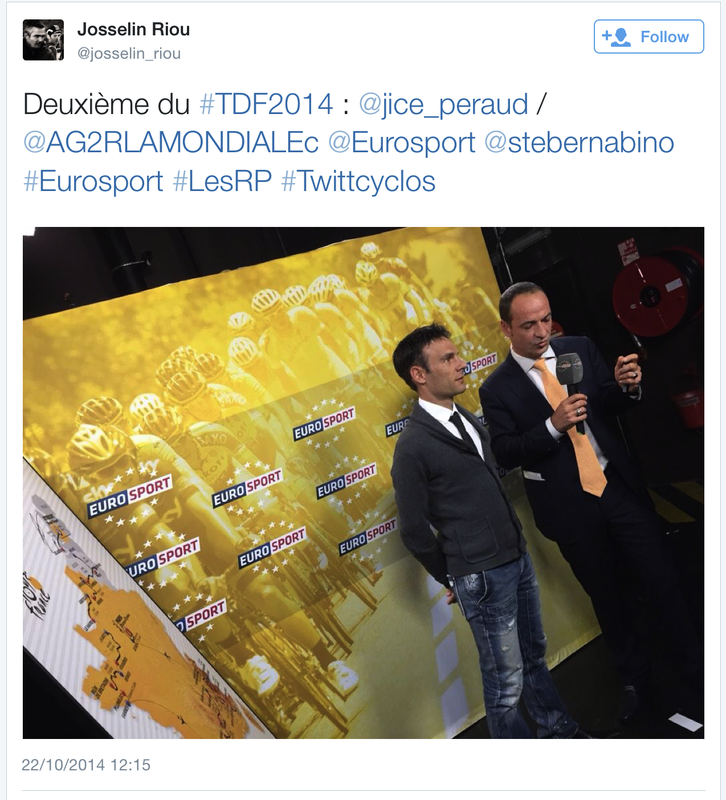 Okay, now we have to get to Peraud’s outfit. I’m kind of okay with the white shirt and tie combo with a Starsky-esque cardigan but the jeans … Oh, J-C, what? the? ….? The hair! THE HAIR! 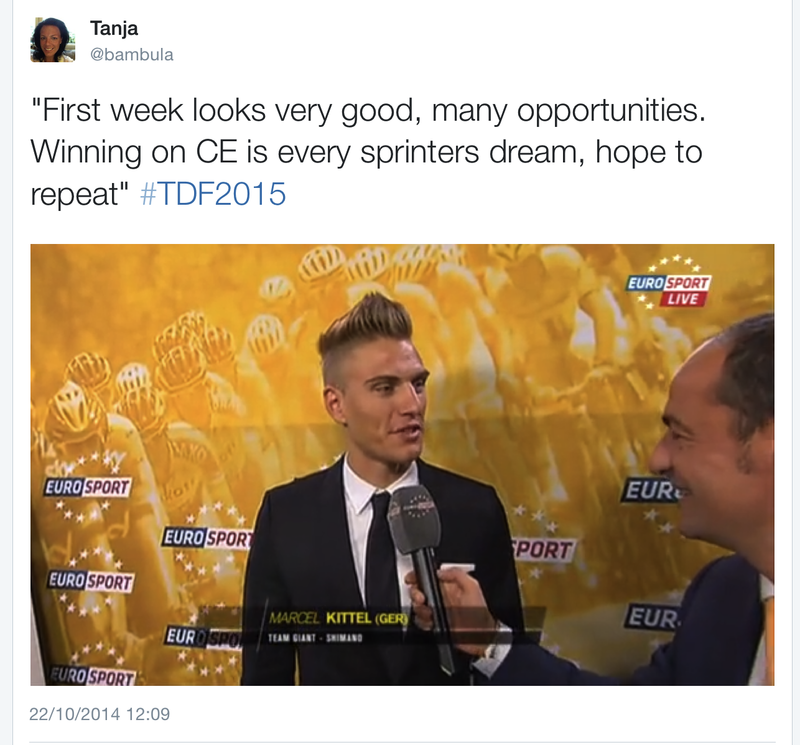 It can only be the ArgoSunGod, Marcel Kittel, with hair that audacious! 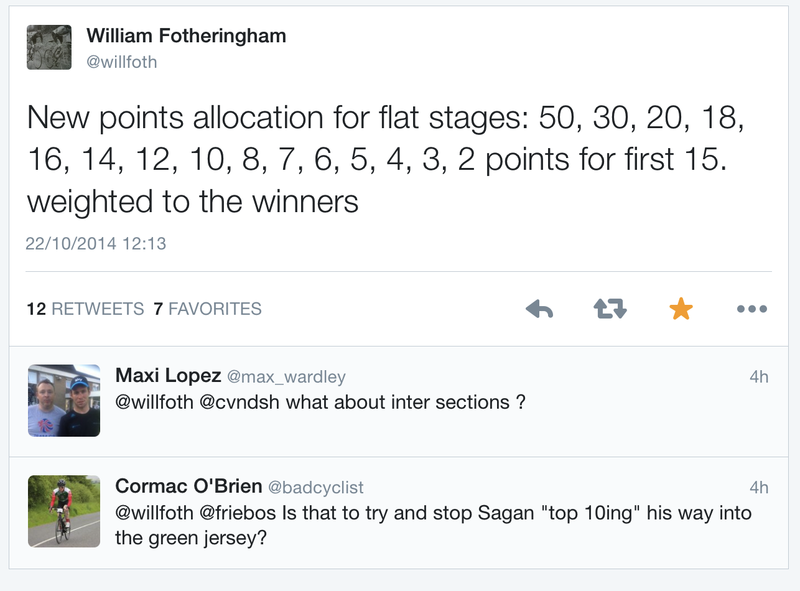 And it looks like he might just sprint himself into the green jersey in the first week, what with some ginormous bonus points for those stage wins. 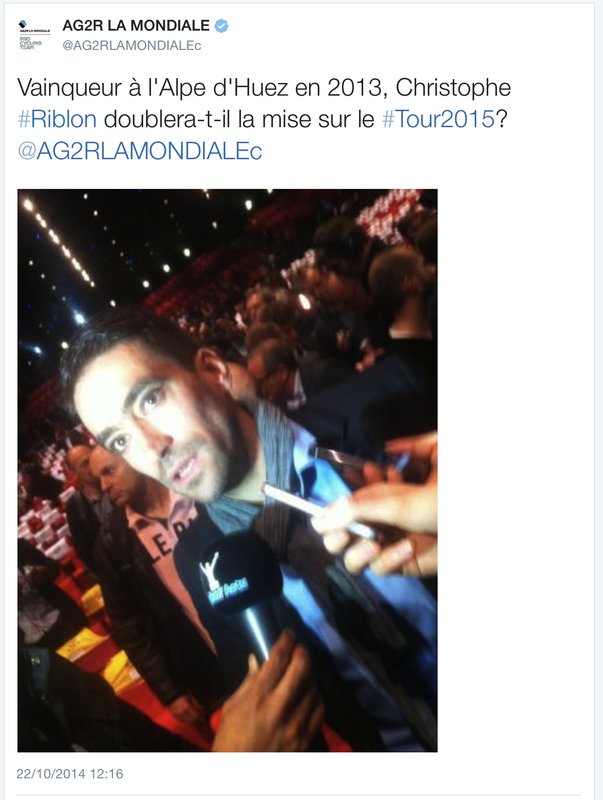 Obviously, the organisers are not happy with the Velvet Samurai locking up the green due to his consistency, because the jersey is awarded for … um … consistency, not stage glory. 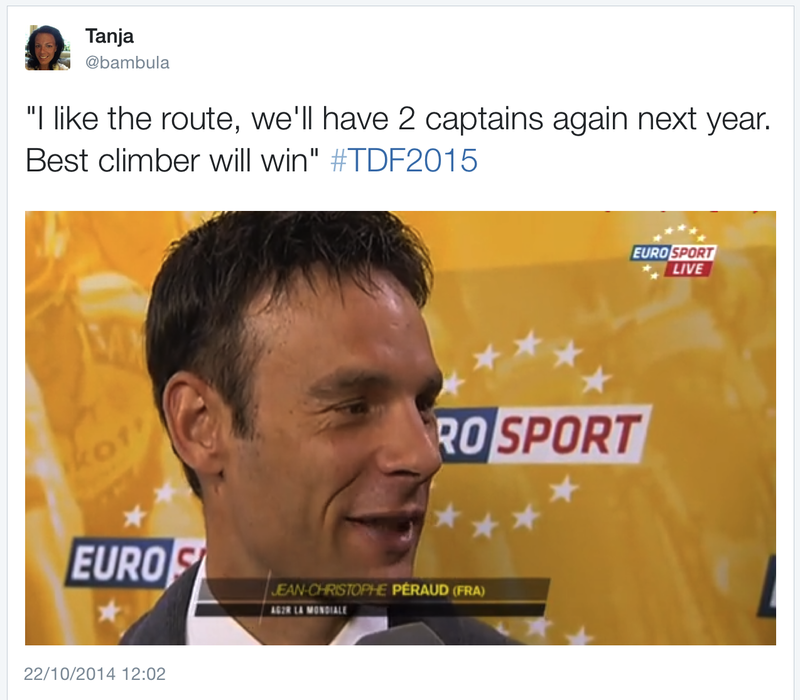 Except now it seems it is awarded for stage glory. 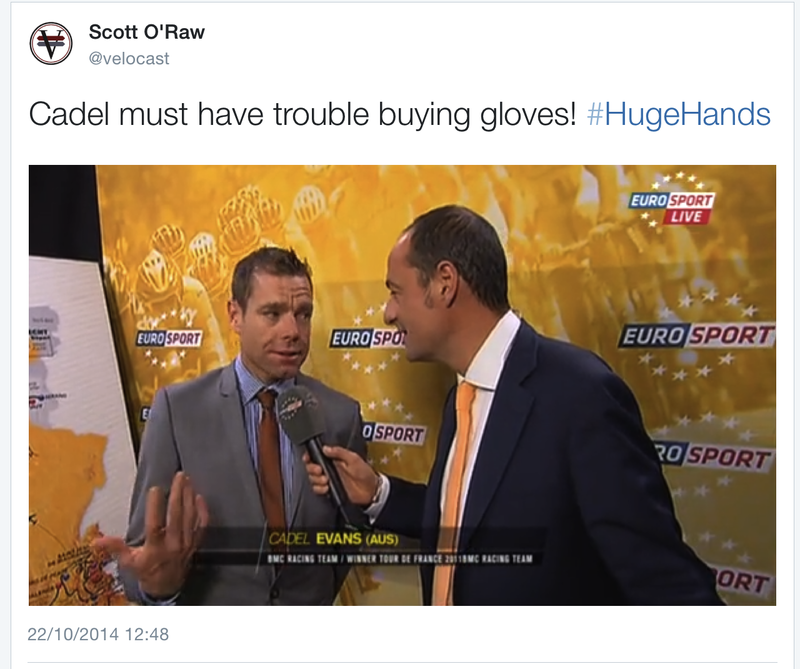 Good to see Cadel at the presentation. Freaked out about the hands, though. Sorry. This is the last picture of the ArgoSunGod. Couldn’t help myself. 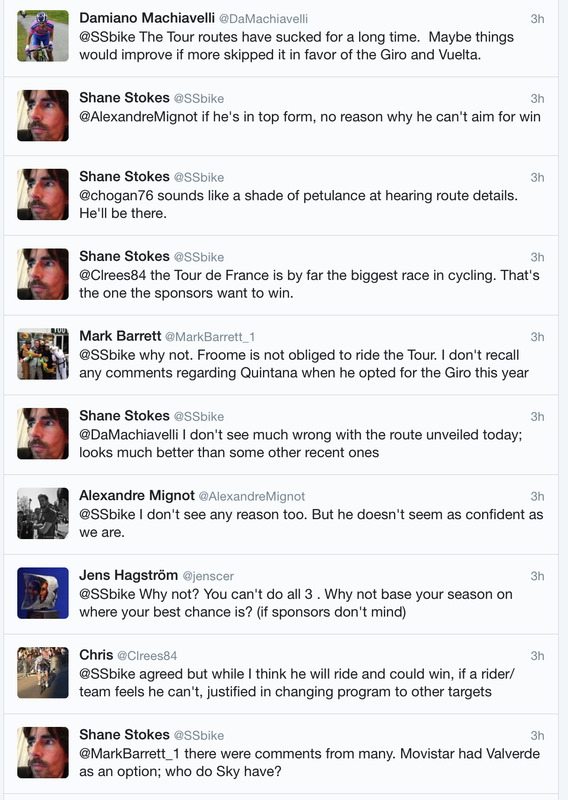 Very mixed reaction regarding the route. 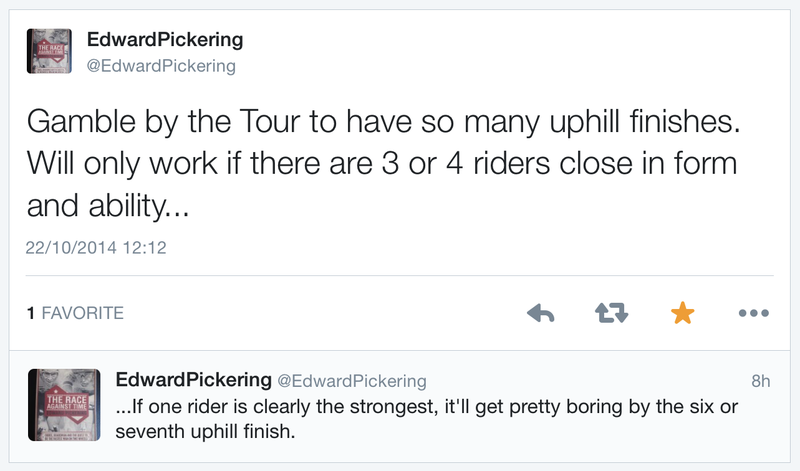 It’s all about the climbing, really. Which means some people love it (me) and some people, not so much. 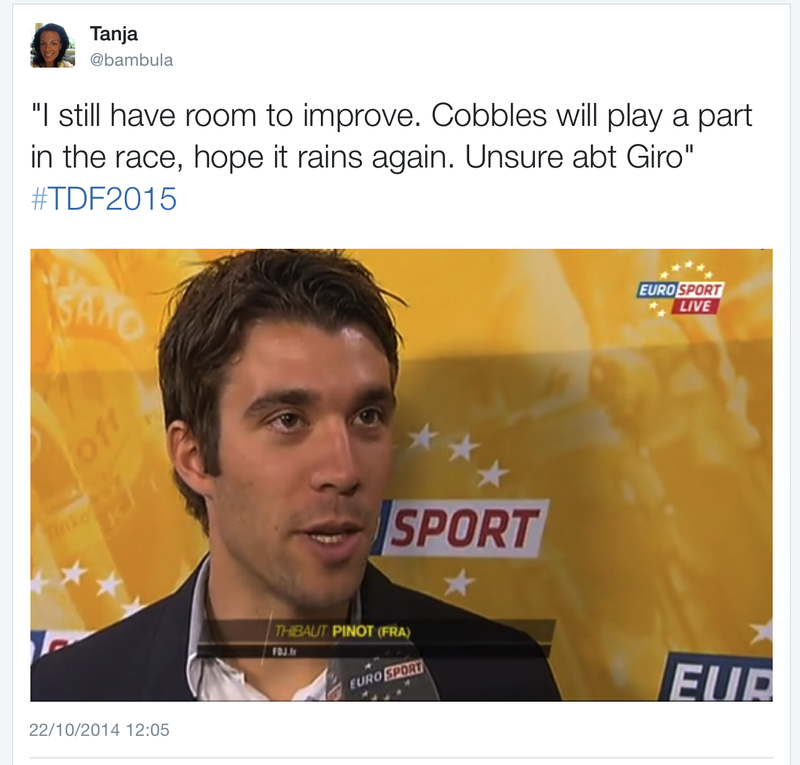 It will, however, be a difficult Tour – no sewing up the race with a good TT performance, no siree. 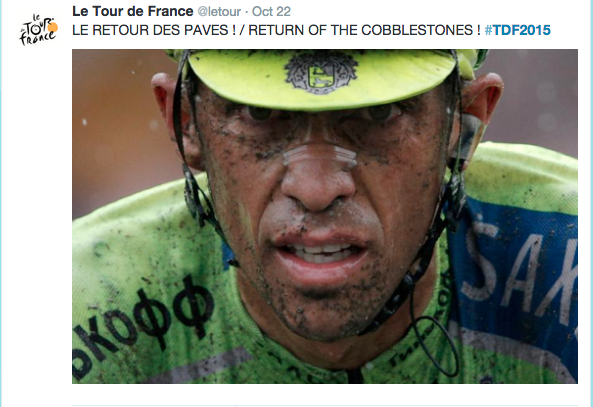 There are also some pesky cobbles again this year! Baby Blackbird states the obvious. 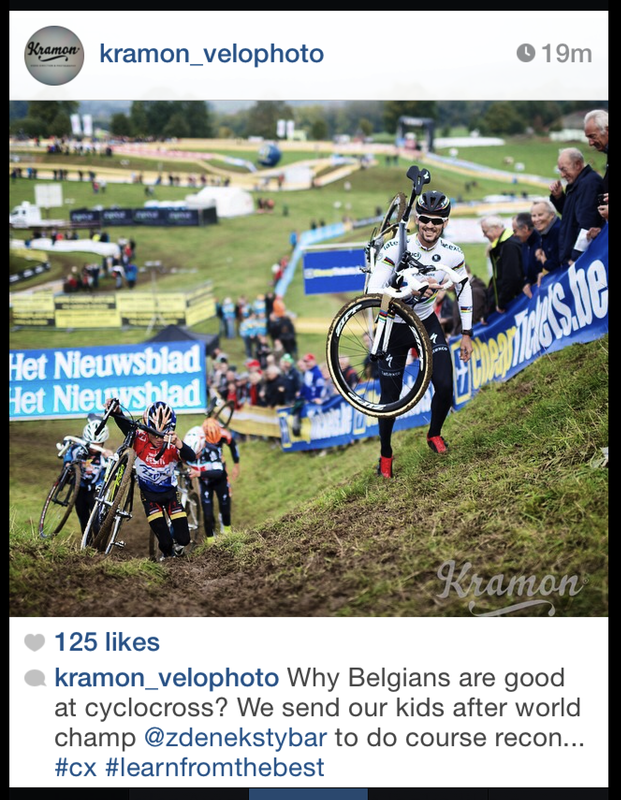 I’m really intrigued as to what a guerrilla OPQS team would be. All in Che Guevara berets and camouflage, hiding in the crowd to jump out at the last minute and take the stage? 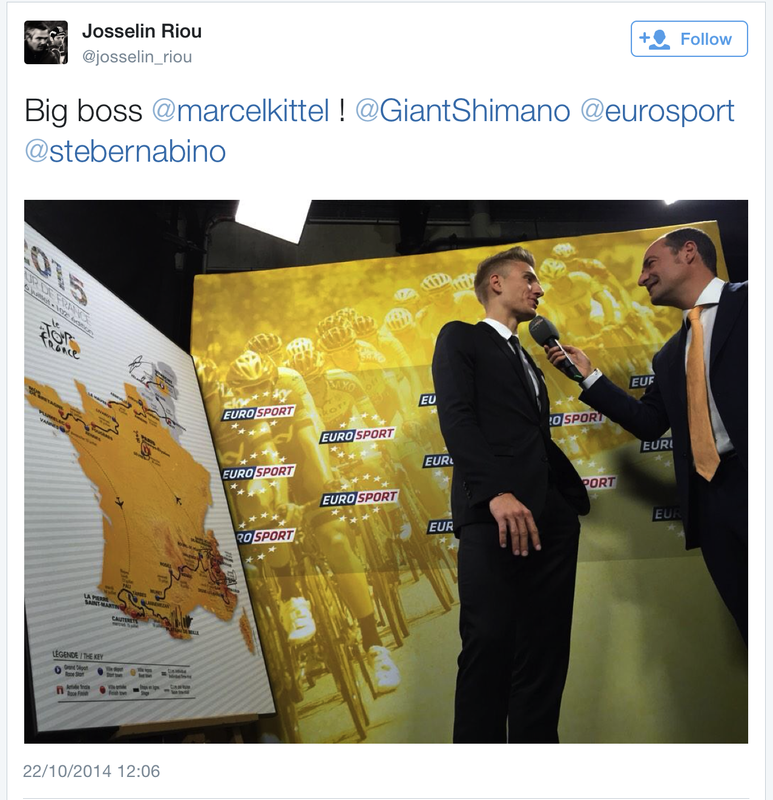 If guerrillas are all about stealth and surprise, are they going to ditch Big Boonen and Little Cav (too conspicuous) or will they be used as a diversion? Enquiring minds want to know! 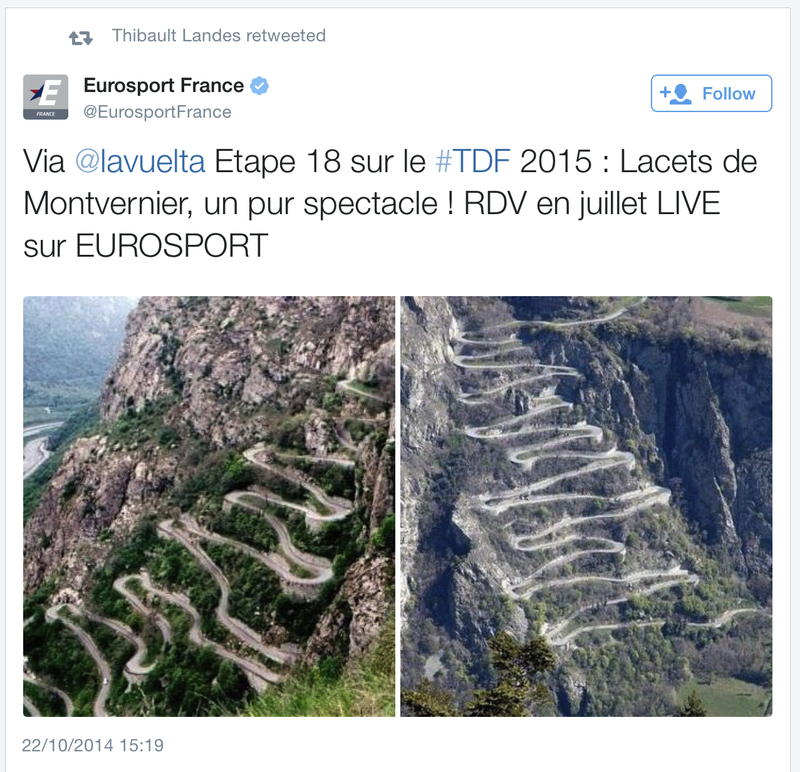 One thing is for sure – EVERYONE is excited about the new Montvernier climb. Tight switchbacks one right after the other. Booking my days off work already to make sure I’m home and tweeting every single kilometre of that climb! 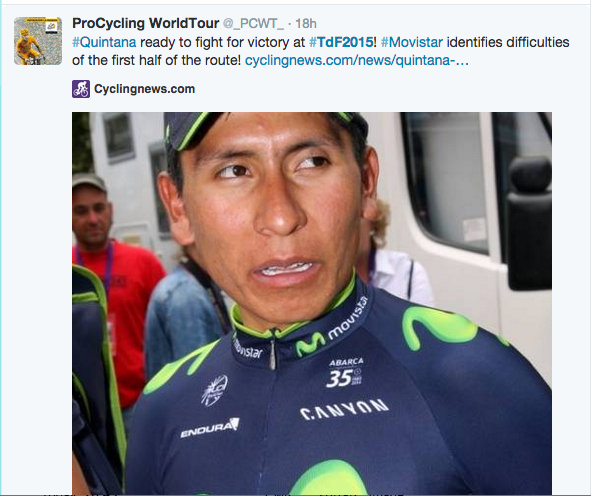 This is Nairo Quintana‘s #IAMEXCITE look. 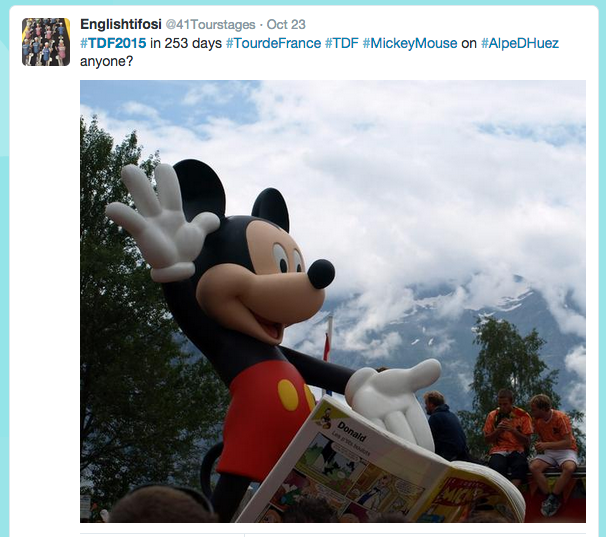 This is Mickey Mouse‘s #IAMEXCITE look. 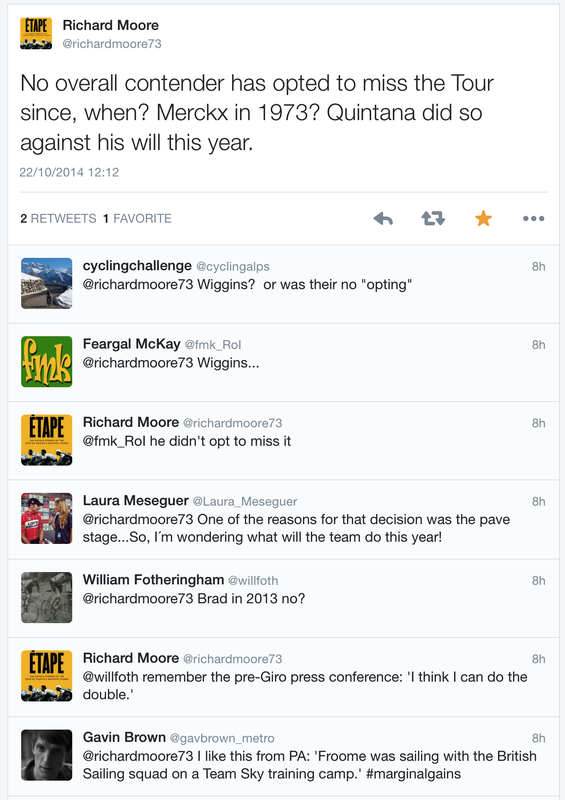 I would love to see Team MTN-Qhubeka on the Tour in 2015. 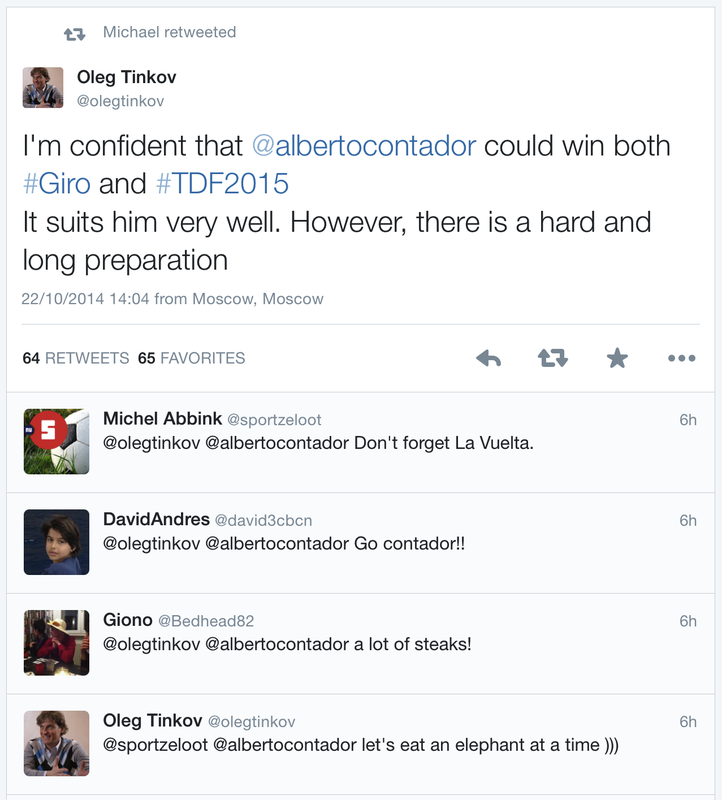 And to finish this section off, Oleg is talking about eating elephants. 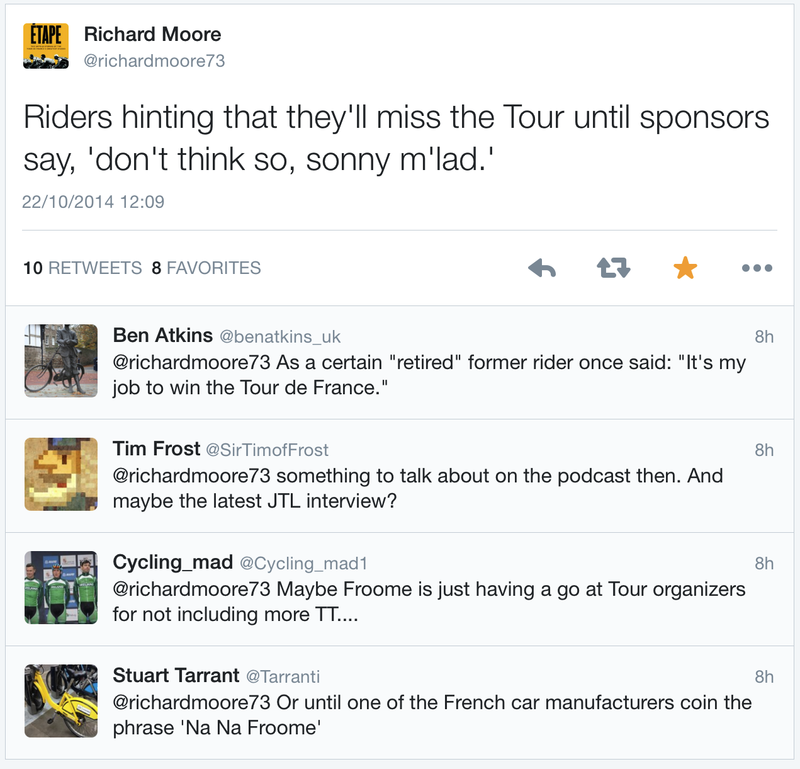 A quick note about the Grand Depart. And to think I didn’t think the publicity caravan could get any crazier looking. A little musical interlude. 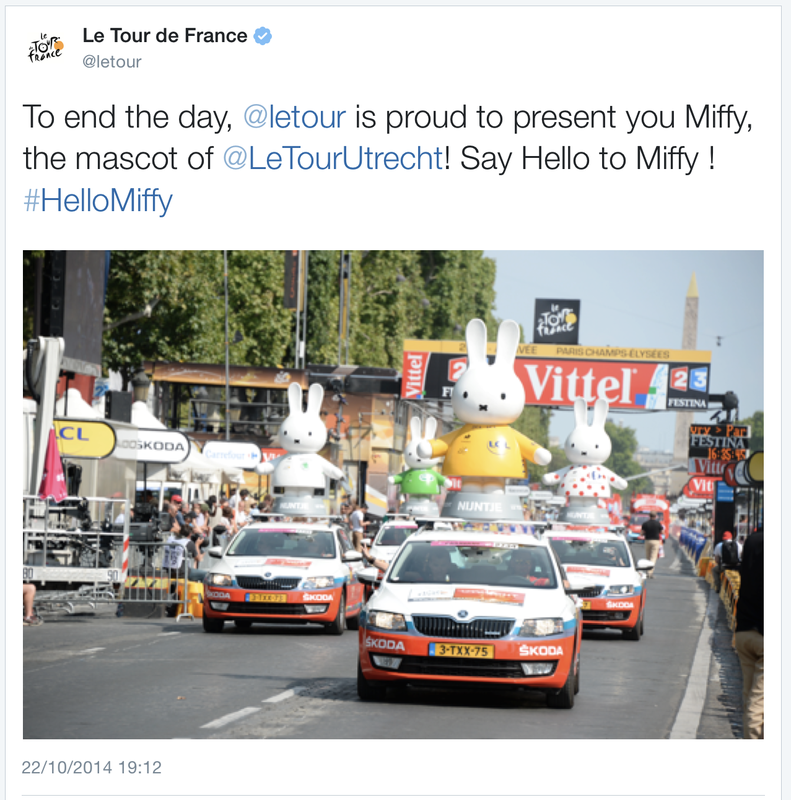 This is BonVoyage – the official song of Utrecht Grand Depart. As the mighty Robert Plant would sing, ooooooh, and it makes me wonder. Hell no, I won’t go! 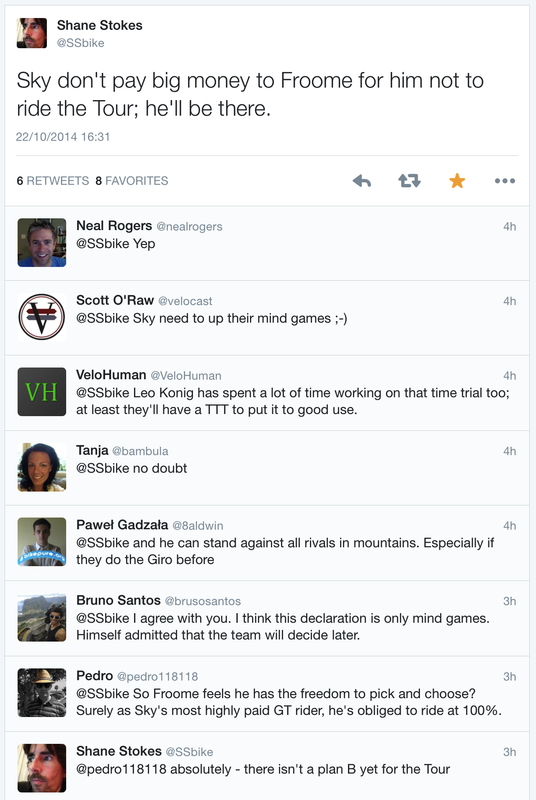 All of the above proved to be just a diversion from the main attraction of the day and that was Chris Froome‘s ‘Too many mountains, not enough TT, I won’t play!’ comments. Set. Twitter. Aflame. 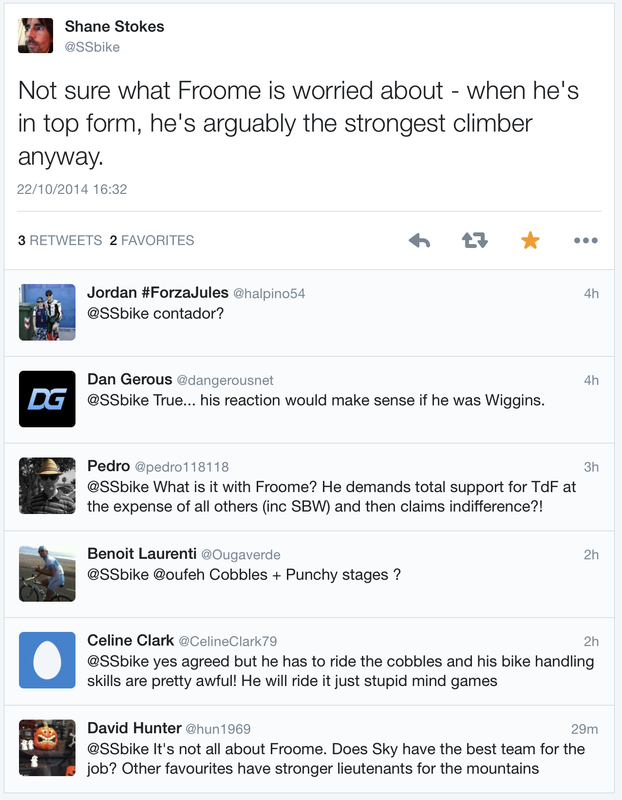 Don’t know about you, but I’ve never thought Chris Froome didn’t like climbing. 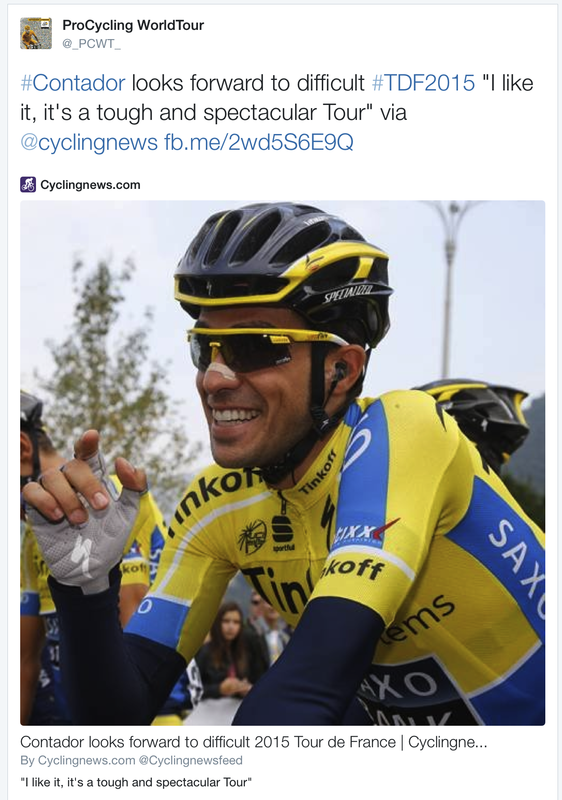 So he’s thinking of doing the Giro/ Vuelta instead. 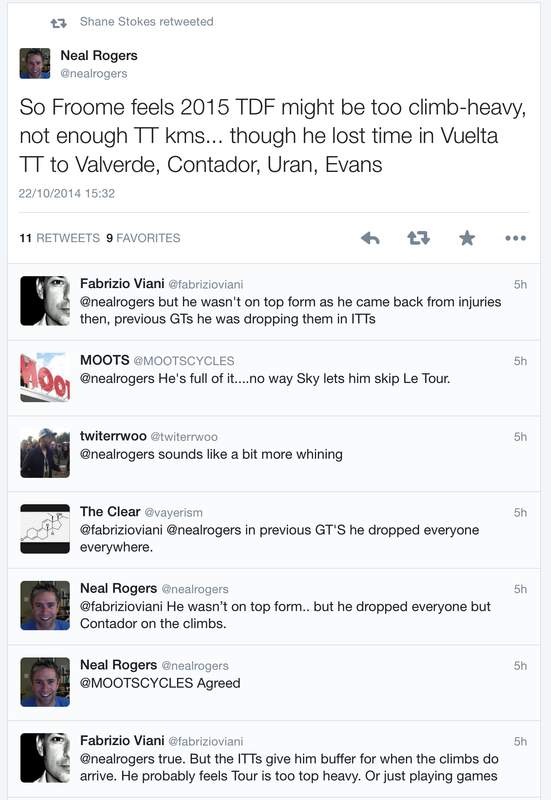 The Vuelta. Which is always about climbing. Even when it’s not. 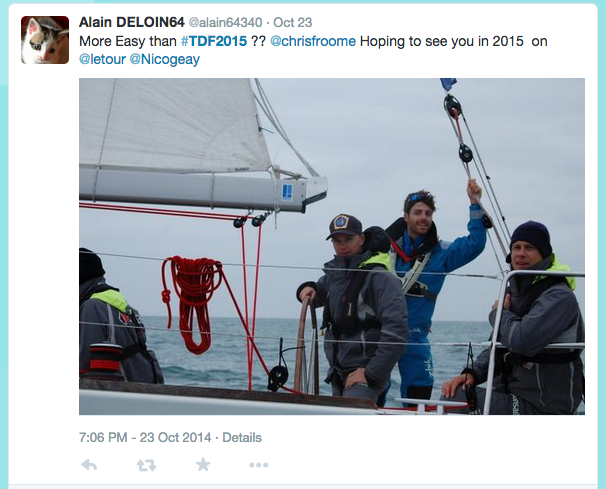 Wiping the sea spray from our eyes (that’s the salty Froome dog in the gigantic puffa jacket), we finally see the truth. 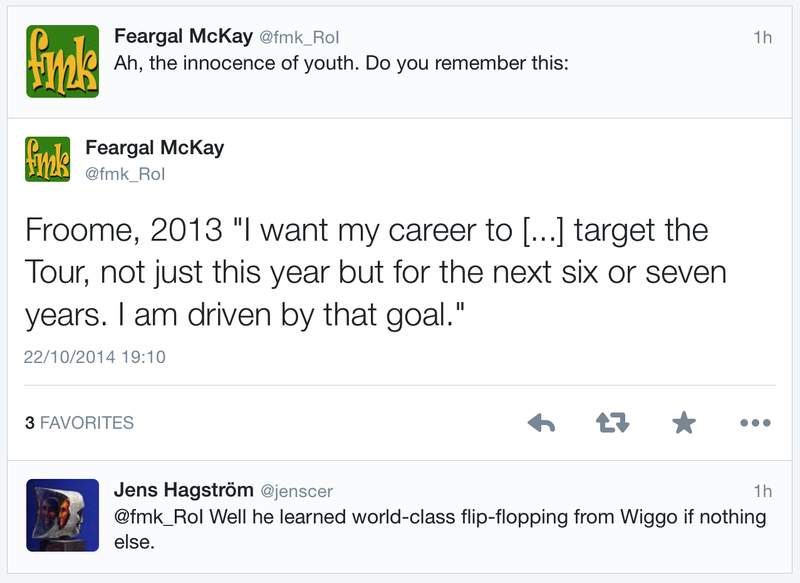 Could Team Sky actually be getting this PR lark right, after all these years? 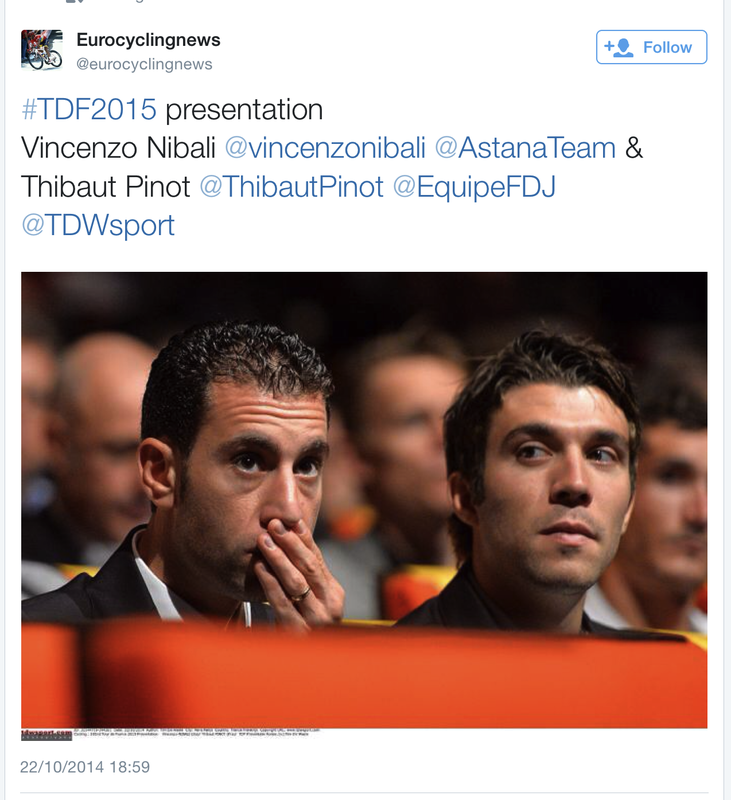 Will we see these two at the Tour next year? 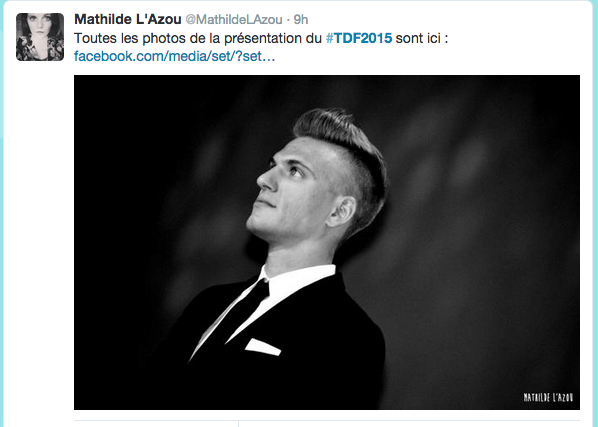 The Sacred Haunches to try to nab the maillot jaune on the prologue and wear it for a week? 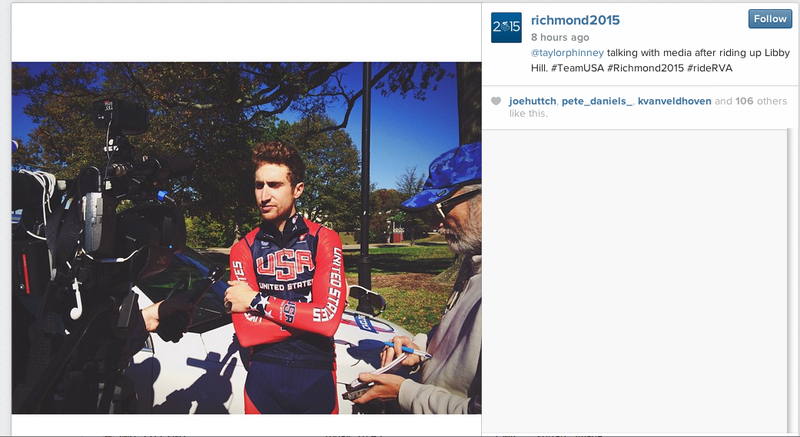 That Boy Phinney to finally race his first Tour? Fingers crossed! I simply thought this picture was charming. 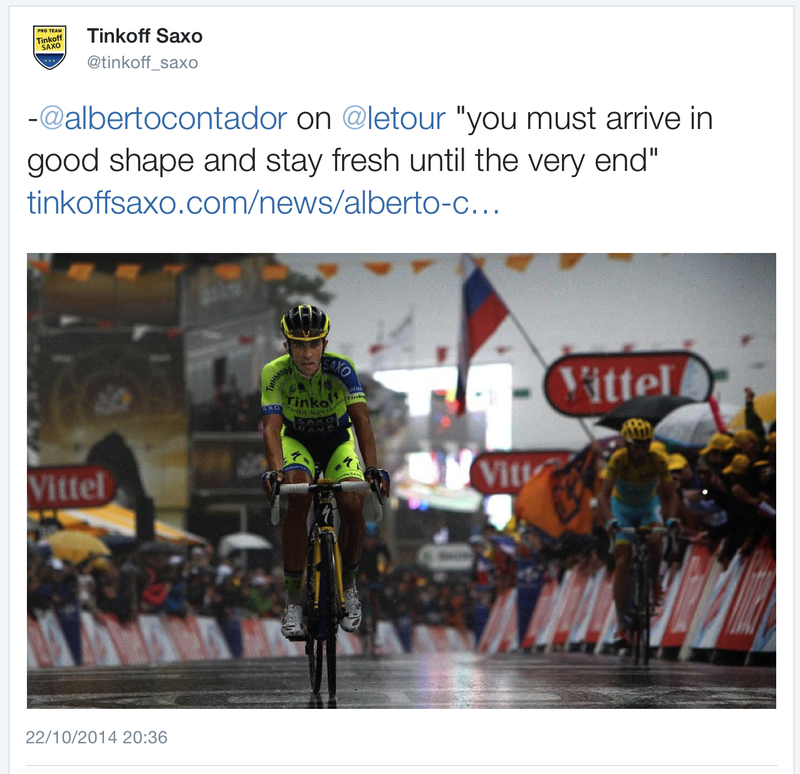 A bumper grand tour calls for a bumper Rider of the Month, and we’ve certainly got that for you. 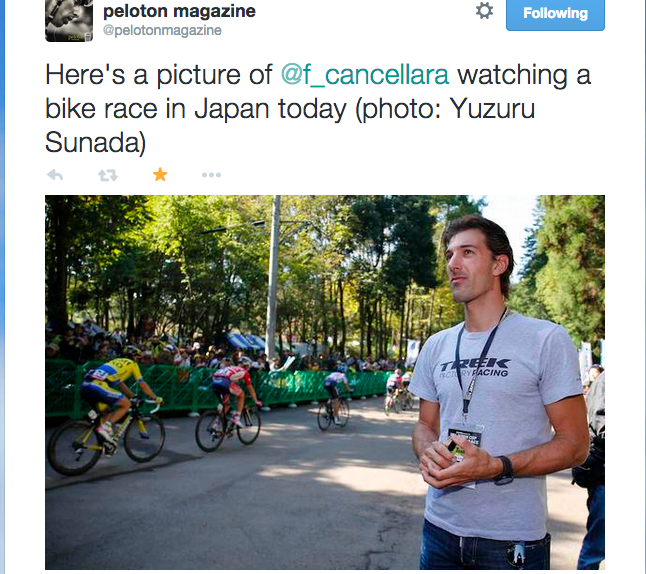 As usual we’re not short of riders to throw into the hat for this prestigious award. 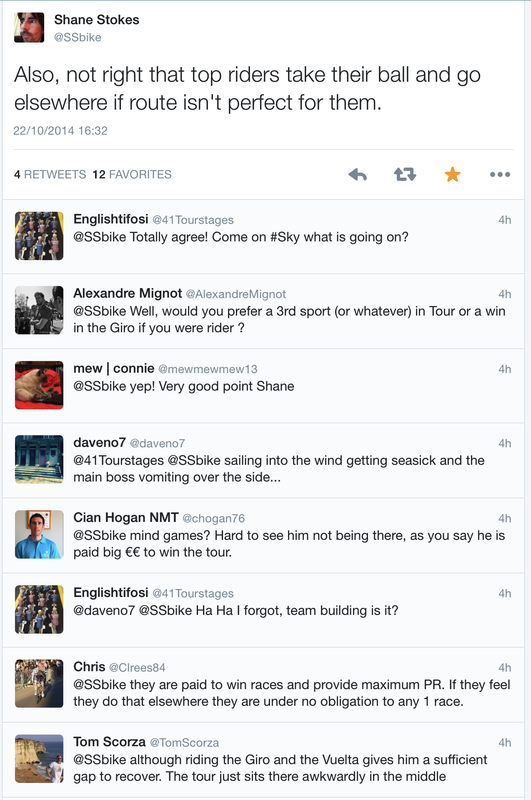 Tour Tweets: The French, the Germans and Oleg Oleg Oleg!